SOLUTIONS BASED: Finding practical solutions to the challenged faced by the client. INTEGRATION: We believe in the richness of diversity and specialize in the art of integrating and merging data and spatial technologies to facilitate access to information and decision making. COMMUNICATION: Spatial data and maps have the ability to convey complex concepts in a simplistic fashion. Our focus is to create user-friendly maps and spatial products which are aesthetically pleasing and serve as a clear and direct communication tools for our clients. INNOVATION: Implementing practical solutions tailored for the South African environment including the use of ‘best breed’ open source solutions. VALUE: We firmly believe in the 80/20 principle in providing cost effective services and products which add value to our clients’ projects and business processes, allowing them to take informed decisions. QUALITY: We pride ourselves on our uncompromised product quality and data accuracy which forms the core of our professionally delivered services and solutions. The diversity of Settlement Planning and Geo-spatial products and services provided by SETPLAN is reflected in the skills and extensive experience of the project team. Ranging from student data captures, Town Planners, GIS Specialists and Senior Software Engineers with 30 years programming experience the composition of the team allows for an integrated, multi-disciplinary approach to be followed. This allows the team to propose and develop creative solutions to address clients’ requirements. SETPLAN’s layout planning approach is based on implementation of the latest Government Policy and represents the crafting of a new community through the application of an alternative settlement design approach which incorporates the principles of integration, sustainability, choice and identity. The resulting settlements incorporate spatial characteristics which give effect to the intentions of the Government’s Breaking New Ground Initiative (BNG). Maps provide a medium to convey and display a diversity of potentially complex sets of both spatial and non-spatial information in a simplistic, integrated manner. As such maps are communication tools, providing not only spatial information to the end-user but also assisting with decision making, both in the public and private sectors. In this regard the group has refined the art of map making, or cartography, with the ability to produce and publish accurate, high quality maps in a short period of time. Mapping products range from small cadastral locality maps to large format layout palns and complex regional maps which reflect and integrate a diverse set of spatial datasets. 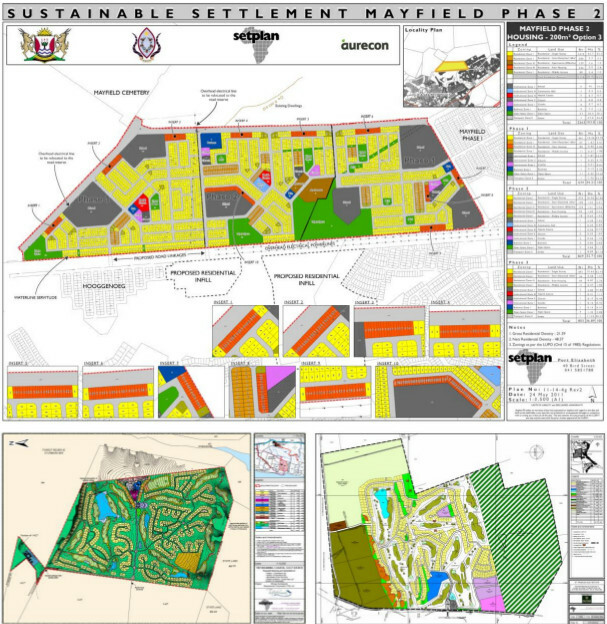 In this regard the team has extensive experience in the creation of mapping products which support and inform spatial planning processes including Spatial Framework Plans (SDF’s), Master Plans, Zoning Maps, Integrated Development Planning (IDP), Housing Sector Plans (HSP) and Areas Based Planning (ABP) etc. At the core of effective map making is the skill of sourcing, integrating and presenting a diversity of spatial and non-spatial data sets and the managed of the data over the entire lifecycle of a project. Often neglected, the data management component of map making is vital for creating credible mapping products and the reports which are based there-on. The process of combining divergent information in a spatially manner also often highlights previously unnoticed trends thus serving to guide decision making. With their extensive experience in the creation of complex mapping products the team has not only refined the process of spatial data integration but has also developed data management, collection and storage solutions to support the map creation process. In addition the team also has expert knowledge in the integration and management of property based information. This includes the integration of cadastral, property ownership, municipal billing and property valuation information. Extensive data analysis techniques are applied on a daily basis to support decision making both in the public and private sectors. Spatial information technologies are extensively used to answer questions such as “How far do you have to travel to the nearest school” or “How accessible is my business location”. Such analysis tools are also employed to determine the optimal location of cemeteries, identification of land for housing purposes or the potential “visual impact” of a proposed development from a specific vantage point. The various analysis techniques employed by the team allow for the cost effective modeling of a diversity of scenario’s thus enabling decision makers to make adequately informed decisions. Supporting the various geo-spatial products and services provided by the team is the OVVIO© range of property, asset and valuation management products (www.ovvio.co.za). Developed in-house by the team in partnership with Sou-West Software, OVVIO© is a cloud/web-based software solution which tightly integrates and maintains property, debtors, asset and project information form a diversity of sources into a single, geospatially enabled portal. Specifically developed around the property and debtor management needs of the public sector OVVIO© incorporates deeds/ownership data, cadastral (mapping) and billing system information together with an array of data reporting and analysis tools including direct access to “external” data sources such as Google Street, Street View, Open Street Map and WinDeed etc. Due to its geospatial capabilities, OVVIO© allows users to visually digest and manipulate property and asset information from various viewpoints in an intuitive and user-friendly web browser based format. OVVIO© is, by design, an enterprise system enabling property information to be securely accessed and shared across an Intranet, VPN or the Internet. Through the incorporation of a spatial element into standard data auditing and data cleansing queries the project team is able to identify shortfalls and inconsistencies within existing datasets. Such techniques are utilized in combination with the team’s Property Management expertise to assist with the assessment of Property Valuation Rolls, cleansing of municipal billing systems data and revenue collection. In addition the team has extensive experience in the cleanup of existing cadastral data for the purposes of creation and maintaining both surveyed and registered cadastral base maps. Spatial data forms the basis on which the team’s various products and services are build. In this regard the accuracy of the spatial data and the speed with which it can be collected / captured determine the practicality and usefulness of the information. The team has developed data capturing systems and procedures to cater for a diversity of on-site GPS surveys, desktop data capturing / digitizing using aerial photography as well as household site surveys. The team recognizes that skills transfer within an ever evolving technology based field is essential to ensure the effective utilisation and interpretation of many of the products and services provided to the end user. In this regard all software solutions provided by the team are accompanied by access to an on-line Resource Centre facility which is continuously updated. In addition on-site training sessions are provided on request from clients and end-users. Effective project management is the key to the successfully implementation of meduim to large-scale geo-spatially based projects. Based on an in-depth understanding and experience of the various factors which influence the implementation of geo-spatial based projects, both within the public and private sectors, the team is able to provide turn-key solutions based on the clients requirements.